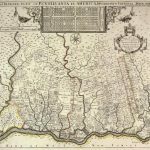 Produced by Pennsylvania’s first surveyor-general, Thomas Holme, A Map of ye Improved Part of Pensilvania in America is one of the first two maps created of Pennsylvania. Drawn in 1687, the map did not go out much farther than the immediate vicinity of Philadelphia. During this period the Schuylkill River approximated the geographic center of the surveyed portions of the colony, which extended along the west side of the Delaware River from the Brandywine Creek and Christiana River in the south, to just beyond the Neshaminy Creek in the north. 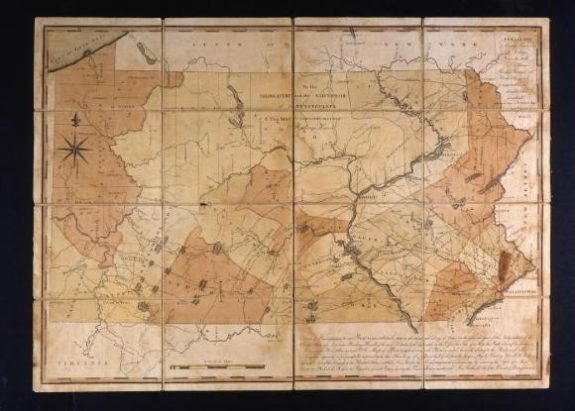 The Reading Howell Map of Pennsylvania, created in 1792, was the culmination of over a century of surveying. The state’s southern and western boundaries were defined by the efforts of multiple survey teams that sought throughout the eighteenth century to complete the efforts of Charles Mason and Jeremiah Dixon, two English surveyors chartered by the Royal Philosophical Society to settle a boundary dispute with Maryland. In the North Branch of the Susquehanna River, Yankees claiming title under Connecticut’s charter organized as the Susquehanna Company in the 1760s and violently competed with Pennsylvania settlers for choice bottomlands. 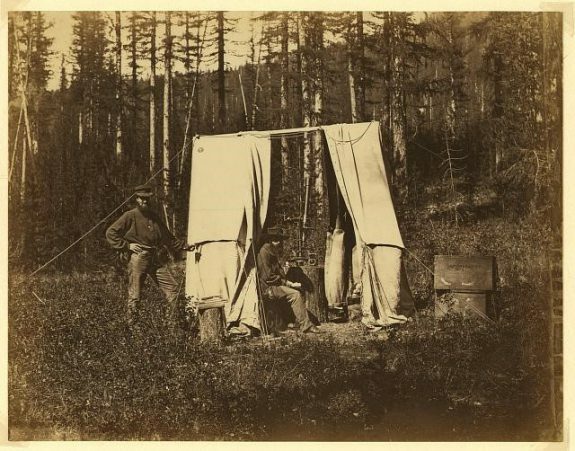 Surveyors used a device called a theodolite (such as in this nineteenth century photograph) to measure horizontal and vertical angles by measuring the angle between magnetic north (or another bearing of the surveyors choosing) and a fixed point in the landscape. Their primary use was to cast straight lines across a landscape from a fixed point called the surveyor’s station. To do this the instrument was set on a tripod and levelled. Using a theodolite, the surveyor trained the instrument’s site on a distant object, usually an assistant’s staff or a fixed geographic feature. He then read the graduated circle to ascertain the angle from which the site-line generated by the instrument deviated from magnetic north, or some other bearing of his choosing. He recorded the angle in his field book (i.e. W 20 degrees, 30 minutes) and with the assistance of a chainman counted off the distance between his station and the distant position using a 66’ long Gunter’s chain. With this method the surveyor was able to inscribe legible lines into the non-linear landscape. 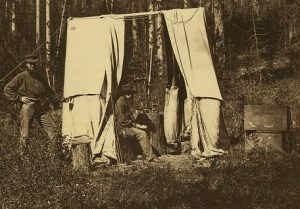 In this nineteenth century image the man in the center is operating a theodolite with a telescope which contained sights set on a graduated circle with a compass. Eighteenth century theodolites, such as Wright’s Common Theodolite, consisted of many of the same features, only instead of a telescopic sight, they utilized two iron sights. Surveying chains also known as a Gunter’s chain were used with a theodolite to measure distance between two points on a line. If properly calibrated, a Gunter’s chain measured to a length of sixty-six feet. 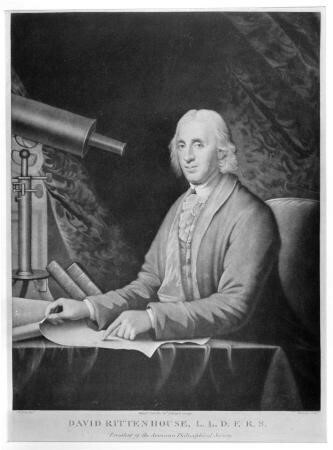 David Rittenhouse, depicted here in a portrait by Charles Willson Peale, was an astronomer, inventor, surveyor, and government official. As a surveyor he helped to definitively establish the boundary between Pennsylvania and Maryland, by completing the survey of the Mason-Dixon Line in 1784. When Mason and Dixon attempted to complete their survey of the line west of the Appalachian Mountains in the late 1760s they were forced to turn back due to threats of violence from local Native Americans. Rittenhouse, along with Andrew Ellicott, ran the boundary all the way to its originally intended endpoint, five degrees west of the Delaware River. 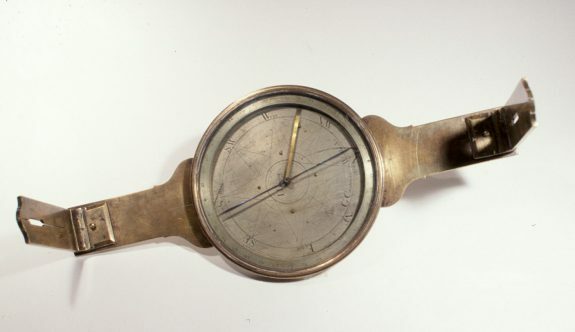 These efforts led to the invention of the Vernier compass, a device that registers the magnetic variation, or deviation between true north and magnetic north. The Vernier compass was developed by David Rittenhouse (ca. 1785) to register the magnetic variation, or deviation between true north and magnetic north. Throughout the eighteenth century colonial surveyors struggled with the fact that the magnetic variation changed with time. This meant that a survey given with reference to magnetic north in, for example, 1720, could not be reliably resurveyed in 1770 because magnetic north migrated to a new position. Rittenhouse’s Vernier compass had an additional arm built into the disc that allowed surveyors to keep track of the changing variation. With constant knowledge of the variation surveyors were easily able to translate their compass bearings with reference to true north, rather than the moving target, magnetic north. Land was the most valuable commodity in the Delaware Valley during the colonial period, and it had to be surveyed before it could be granted or transferred. In Pennsylvania, William Penn (1644–1718) relied upon surveyors to measure and map his new lands. Colonial surveyors established tract, manor, township, and county boundaries, laid out city streets and lots, determined borders between Pennsylvania and neighboring provinces, located the likeliest routes for roads connecting the hinterland, and established inland navigation routes and mill sites. West Jersey’s proprietors similarly relied on surveyors. Employing techniques and instruments developed in England, Ireland, and Scotland during the great enclosure movement, colonial surveyors imposed European notions of order on the Delaware Valley. In both Pennsylvania and West Jersey, the authority to produce official surveys rested with the appointed surveyor-general, a prestigious and influential post that included a seat on the Provincial Council. Thomas Holme (1624–95), Pennsylvania’s first surveyor-general, arrived from England in 1682 as part of a commission of four who sited and surveyed Philadelphia ahead of William Penn’s arrival. 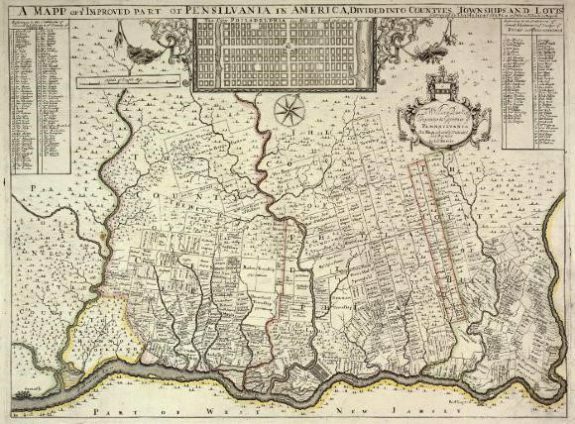 Holme produced the first two maps in Pennsylvania, A Portraiture of the City of Philadelphia in the Province of Pennsylvania in America (1682) and A Map of the Improved Part of the Province of Pennsilvania in America (1687). Pennsylvania’s modern boundaries were not officially fully surveyed until 1792. The extent of the work performed in the interim can be gauged by comparing Holme’s maps with that of Reading Howell (1743–1827), A Map of the State of Pennsylvania (1792), which represented the culmination of eleven decades of painstaking surveys performed by hundreds of men, occasionally under adverse physical and social conditions. Every land patent in the greater Delaware Valley was contingent on an official survey return. When the provincial land-granting apparatus issued a parcel of land to a developer it also issued a concomitant “warrant to survey,” which directed the surveyor-general to survey and lay out the tract. The surveyor-general then deputized one of an estimated one hundred and fifty surveyors active throughout the Delaware Valley during the colonial period to perform the work. Beginning in 1700 and mirroring bureaucratic trends throughout the mid-Atlantic colonies, deputies working in Pennsylvania were required to post a bond and take an oath of office as a guarantee of their skill and honesty. With the survey return in hand, the surveyor-general checked the work for accuracy and attempted to ensure the new patent did not conflict with existing property claims. In theory, Delaware Valley surveyors were a tightly controlled cohort, but the practice of performing unofficial surveys on behalf of unpatented property holders by undeputized surveyors became increasingly common by the last years of the colonial period. Surveying was a respected skill in colonial society, and surveyors served as vital links between local communities and the provincial government. Surveying was a seasonal task and a skill that contributed to the livelihood of men who were also farmers, millers, craftsmen, or petty regional bureaucrats. Delaware Valley surveyors drew on English methods and learned as apprentices under fathers or uncles or were taught by private instructors. After 1755, the College of Philadelphia (later the University of Pennsylvania) also taught surveying theory. Many surveyors were self-taught, despite the range of skills required. Two of the most trusted manuals used by local surveyors were Geodaesia: or the Art of Surveying and Measuring of Land Made Easie (twelve editions; 1688–1793) by John Love and The Practical Surveyor, or the Art of Land Measuring Made Easy (five editions through 1764) by Samuel Wyld. Surveying required knowledge of basic geometry, and surveyors learned to see land as a linear jigsaw puzzle. When preparing a survey return, they constructed perpendiculars, proportionally divided lines, and reduced irregular polygons into triangles. These skills, coupled with basic arithmetic, allowed them to adjust field measurements to account for the curvature of the earth, calculate the area of irregular shapes and ovals, discover elevation, divide a piece of land several ways, and scale surveys to fit a map. 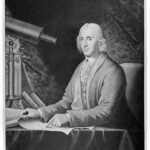 Elite surveyors such as Andrew Ellicott (1754–1820), who worked on Pennsylvania’s boundary surveys, paired these skills with observations of the stars to find a meridian line, calculate latitude, and find the altitude and zenith of any star in the sky. Before 1750, there were few local instrument makers, and surveyors relied on English manufacturers for their tools, which included the magnetic compass, circumferentor, theodolite, Gunter’s chain, level, and plane table. 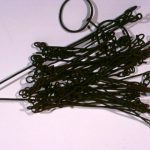 A competent surveyor maintained and repaired his instruments as needed, however, inaccurate compasses and damaged or stretched chains remained a common source of error throughout the colonial period. The most important drafting instruments were the protractor, plain and diagonal scales, and the trigonometric table. The surveyor-general checked all his deputies’ work for accuracy and took half the surveying fee. With the remainder, the deputy paid himself and his crew, which could be as large as a half-dozen men on extensive surveys. Surveyors did not get rich surveying; over the course of a summer season a busy surveyor made about one-tenth the annual income of a successful lawyer. However, they did command invaluable intelligence about frontier landscapes, an asset that several prominent deputies were able to parlay into social status. Despite their important role in colonial society, Delaware Valley surveyors were routinely unable or unwilling to meet the exacting or unethical expectations of their patrons. Colonists demonstrated a willingness to forge survey warrants, bribe chain carriers and surveyors, and issue death threats in order to acquire, protect, or enlarge their claims to patented land. 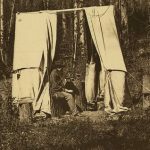 When in the field, surveyors also faced unpredictable weather, hostile Natives, recalcitrant squatters, and technical difficulties as routine challenges in the production of accurate survey returns. While the Delaware Valley did not witness unrest on the scale of the land riots in New York or East Jersey, conflict was common in the Susquehanna Valley and many boundaries between adjacent tracts and provinces were left unresolved. Conflicting land titles issued from competing sovereigns were a recurring source of social unrest throughout the mid-Atlantic during the colonial period. In the lower Susquehanna, Cresap’s War broke out in the 1730s along Pennsylvania and Maryland’s disputed border. The inability of colonial surveyors to accurately survey long meridian lines led Thomas Penn (1702–75) and Lord Baltimore (1731–71) to turn to the London Board of Trade to settle the contested boundary between their colonies. The board turned to the Royal Philosophical Society, which appointed leading English surveyors Charles Mason (1728–86) and Jeremiah Dixon (1733–79), who successfully surveyed what became known as the Mason-Dixon Line. Elsewhere, along the North Branch of the Susquehanna, Yankees claiming title under Connecticut’s charter organized as the Susquehanna Company in the 1760s and violently competed with Pennsylvania settlers for choice bottomlands. In terms of technique, the magnetic variation from true north posed the greatest challenge to colonial surveyors. 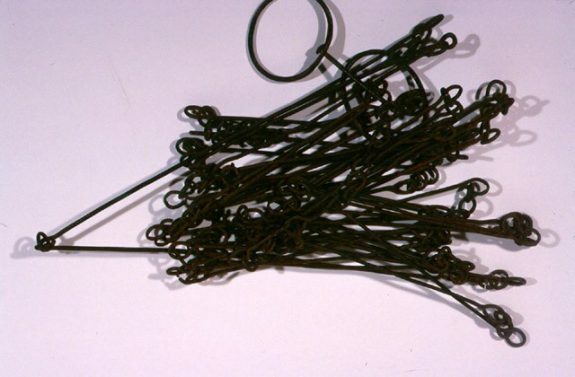 Compass needles pointed to magnetic north, a target that moved substantially during the colonial period and at times and places differed from true north by as much as eight degrees. New Jersey surveyor-general James Alexander (1691–1756) identified the problem and its potential to lead to disputes and social unrest as early as the 1740s. During the late colonial period, surveyors practiced several unreliable or difficult schemes to find true north. 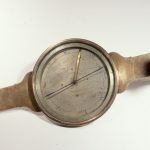 Under the leadership of David Rittenhouse (1732–96), the American Philosophical Society led the effort to devise a practical method of discovery, which led to the development of the Vernier compass in the early 1780s. Andrew Ellicott worked closely with Rittenhouse on several surveys, including of the commonwealth’s northern and western boundaries, and his experience made him a national authority on finding true north. He shared his expertise by publishing Several Methods by which Meridional Lines may be found with Ease and Accuracy (1796). Many of the social and technical challenges that perturbed the Delaware Valley’s colonial surveyors were removed by 1800. 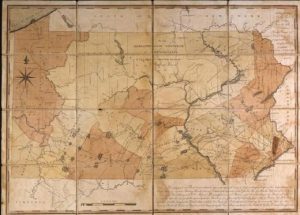 The Native American frontier moved into central and western Pennsylvania, where enormous tracts were laid out using the new grid system pioneered by the federal land survey. New techniques and the larger scale of surveys marked the early national period as a new era in the history of surveying. But these new methods built upon the work of the Delaware Valley’s colonial surveyors, who, working in the midst of a deeply contested landscape and without a reliable method of determining a standard reference point, inscribed a European sense of order into the land. Bruckner, Martin. “The Surveyed Self: Geodesy, Writing, and Colonial Identity in Eighteenth-Century British America,” in The Geographic Revolution in Early America: Maps, Literacy and National Identity. Omohundro Institute of Early American History and Culture: The University of North Carolina Press, 2006. Corcoran, Irma. Thomas Holme, 1624–1695: Surveyor General of Pennsylvania. Memoirs of the American Philosophical Society. Vol. 200. Philadelphia: American Philosophical Society, 1992. Gallo, Marcus. “Imaginary Lines, Real Power: Surveyors and Land Speculation in the Mid-Atlantic Borderlands, 1681-1800.” Ph.D. diss., University of California, Davis, 2012. Hindle, Brooke. David Rittenhouse. Princeton, N.J.: Princeton University Press, 1964. Jordan, John W. “William Parsons. Surveyor General, and Founder of Easton, Pennsylvania,” The Pennsyslvania Magazine of History and Biography 33, no. 3 (1909). Lemon, James T. The Best Poor Man’s Country: A Geographic Study of Early Southeastern Pennsylvania. Baltimore, Md. : Johns Hopkins University Press, 1972. Love, Barry. “The Colonial Surveyor in Pennsylvania: A Dissertation in History and Philosophy of Science.” Ph.D. diss., University of Pennsylvania, 1970. Munger, Donna Bingham. 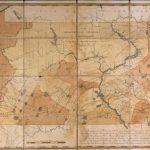 Pennsylvania Land Records: A History and Guide for Research. Wilmington, Del. : Scholarly Resources, Inc., 1991. Rogers, Hannah Benner. “The Planting of Philadelphia: a Seventeenth-Century Real Estate Development.” Pennsylvania Magazine of History and Biography 92, no. 2 (April 1968): 143–94. Warner, Deborah Jean. “True North—And Why It Mattered in Eighteenth-Century America.” Proceedings of the American Philosophical Society 149, no. 3 (September 2005): 372–85. Jacob and Isaac Taylor Papers (1672–1775) and David Rittenhouse Papers (1755–1802), Historical Society of Pennsylvania, 1300 Locust Street, Philadelphia. John Lukens Papers; Moses Moon Cyphering Book; and David Rittenhouse Papers (1732-96), American Philosophical Society, 105 South Fifth Street, Philadelphia. Records of the Land Office (RG-17), Pennsylvania State Archives, 350 North Street, Harrisburg, Pa. The City Plan of Philadelphia Monument, National Historic Civil Engineering Landmark, Logan Square, 200 N. Nineteenth Street, Philadelphia. Thomas Holme historical marker, Pennypack Park, 3000 Holme Avenue, Philadelphia. Mason-Dixon Survey historical marker, Front and South Street, Philadelphia. Here those interested in early surveyors can see a David Rittenhouse compass, a Benjamin Rittenhouse compass, with original pole and late 18th century chain. The Benjamin compass has the Vernier ring mentioned in the above article. We hope your readers will visit.